Albert Einstein sent Marie Curie a letter about the critical public that's now in Princeton's archive. 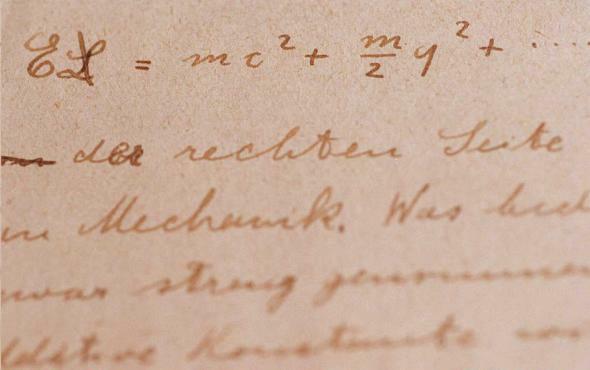 Einstein’s earliest surviving manuscript on the Theory of Relativity. What did one of the world’s all-time geniuses write about? On Friday, Princeton University posted The Collected Papers of Albert Einstein, an archive of Einstein’s documents and letters. The 5,000 searchable items—in their original German as well as English translations—span from his birth in 1879 to 1923, and the project will eventually include everything up to Einstein’s death in 1955. In his correspondence, Einstein sends love letters, talks about scientific papers and his work, makes plans, and recounts visits. It’s amazing to get such an intimate window into his life. But as his career went on, he began to resent his fame. I am so enraged by the base manner in which the public is presently daring to concern itself with you that I absolutely must give vent to this feeling. However, I am convinced that you consistently despise this rabble, whether it obsequiously lavishes respect on you or whether it attempts to satiate its lust for sensationalism! Anyone who does not number among these reptiles is certainly happy, now as before, that we have such personages among us as you, and Langevin too, real people with whom one feels privileged to be in contact. If the rabble continues to occupy itself with you, then simply don’t read that hogwash, but rather leave it to the reptile for whom it has been fabricated. Reptiles! You tell ’em, Albert. He’s basically reassuring her that she’s for real, and saying that she should just avoid reading the comments. Of course then he casually writes, “P.S. I have determined the statistical law of motion of the diatomic molecule in Planck’s radiation field by means of a comical witticism, naturally under the constraint that the structure’s motion follows the law of standard mechanics.” Naturally. E=MC^2 is great and all, but let’s not forget Einstein’s important contributions to the field of h8ers gon h8.